It’s tea time! Thyme tea time! About time for thyme tea time! Fun homonyms aside, thyme tea has a number of health benefits that’s earning itself a place in an increasing number of mugs. Thyme is a herb you’re likely familiar with from cooking. It comes from the mint family and can be used to complement poultry, lamb, veal, fish, chowders and more. But it’s far more versatile than even its range of food pairings would suggest. With over 400 subspecies it has also been used for embalming by the Egyptians and as incense by the Greeks. 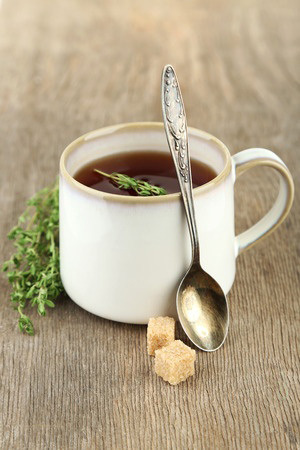 Among many other hailed benefits, Thyme tea is said to be good for acne. This is due to its antibacterial properties. Its minty qualities also make it good for clearing sinuses, while many claim it helps to settle the stomach. But with its antibacterial properties and its ability to open up the airways, it’s great for colds. Additionally, it contains a number of minerals, flavonoids, phenols and volatile oils. One study suggests it may also be good for the brain and protect against neurodegeneration (1). To make thyme tea, just boil a pot of water and add the leaves to the water. Give it two minutes and then drink as you please. Thyme tea is quick to make and it’s much more pleasant tasting than you might reasonably think. It has a number of potential health benefits too, so next time you’re out of your regular tea bags, drop it in a mug with some hot water and see what you think. There are plenty more teas you can drink that provide a number of different health benefits. So perhaps the best advice is just to drink more tea.